What kind of socks do you wear skiing? It may sound trivial, but an incorrect answer to this question definitely exists. If you’re reaching for the wrong material or even cut, you're likely sacrificing comfort and warmth for the day. The right socks, in addition to a boot fit and custom footbed, will help you get the most out of your skiing experience. So, what's the incorrect answer we mentioned above? Cotton. Cotton is not your friend. While in some cases cotton may indeed be “The fabric of our lives,” amongst the outdoor community, the saying is "Cotton kills." Cotton absorbs moisture and when it does, it loses its insulating properties. This means that when your feet inevitably sweat, they will be cold and wet. Even on a cold day, your feet will sweat, whether it be while skiing or when you step inside for a break and start to warm up. Wool socks, on the other hand, are great for staying warm, even when wet. Wool is a great alternative to cotton because of the material’s natural ability to transfer moisture away from the skin, and to remain stink-free for a longer period of time. Synthetic socks won’t do quite as well for either purpose, but they will allow you to manipulate the material a bit more. So if you’re looking for a compression sock, synthetic socks can provide more pressure, which will increase circulation and ultimately keep your lowest extremities warmer. The ideal sock is a low volume, well-fitting number that will give you a precise and snug connection to the boot liner. Another important nugget of sock wisdom: find a pair of ski socks with a designated left and right foot as this will eliminate extra fabric. Space inside a boot liner is limited when a boot fits correctly, and this will be compromised by unnecessary material getting in the way. 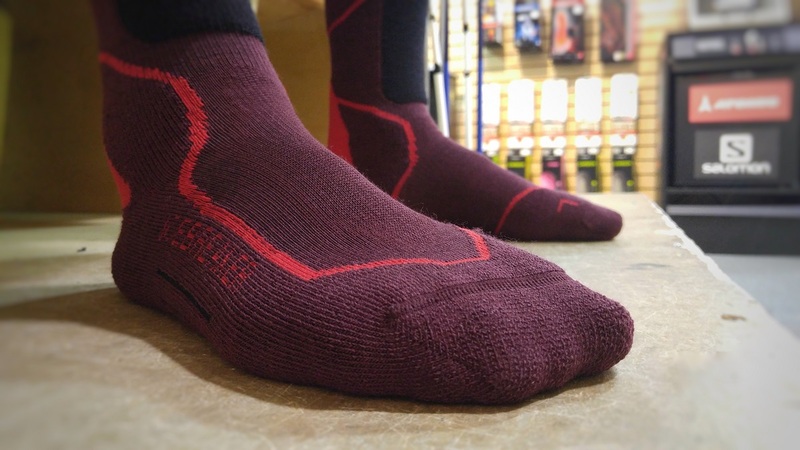 If you want to step it up a notch, we suggest you check out Lenz Heat Socks. These ingenious socks have a heating element woven into the fabric that you can control from your smart phone. This is no gimmick; we can say from experience that they're fantastic. If you get into these socks, your feet will never be cold again. Overall, the most important thing is to stay away from cotton and to find a thin, snug sock. If you’re reaching for the wrong material or fit, you're likely sacrificing comfort and warmth for the day.